My beloved likes a slice of cake with his afternoon cuppa. Visitors had eaten all the pain d’epice I’d made last week-end so, this afternoon, I decided to make some banana bread. Largely because I had some ripe bananas hanging around in the fruit bowl. I then discovered I needed to replace the batteries in my kitchen scales but someone – no prizes for guessing who – had found my secret cache and used them! 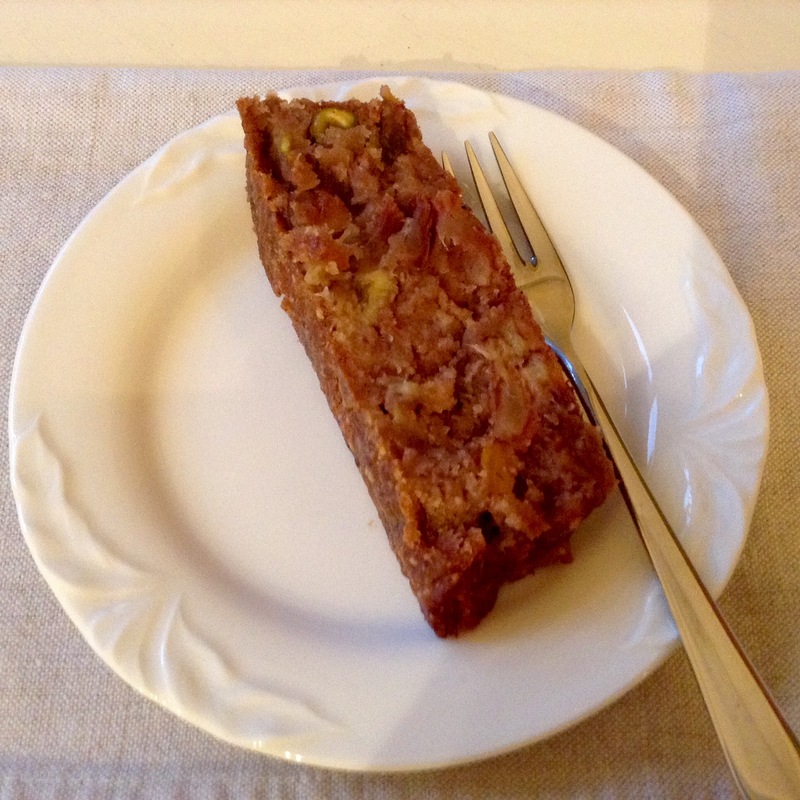 Undeterred, I used my measuring spoons to make this spiced, mixed fruit, banana cake which used up a few odds and ends I had in the cupboards. 1. Preheat oven to 170ºC/150ºC fan/gas mark 3 (325ºF/300ºF fan). 2. 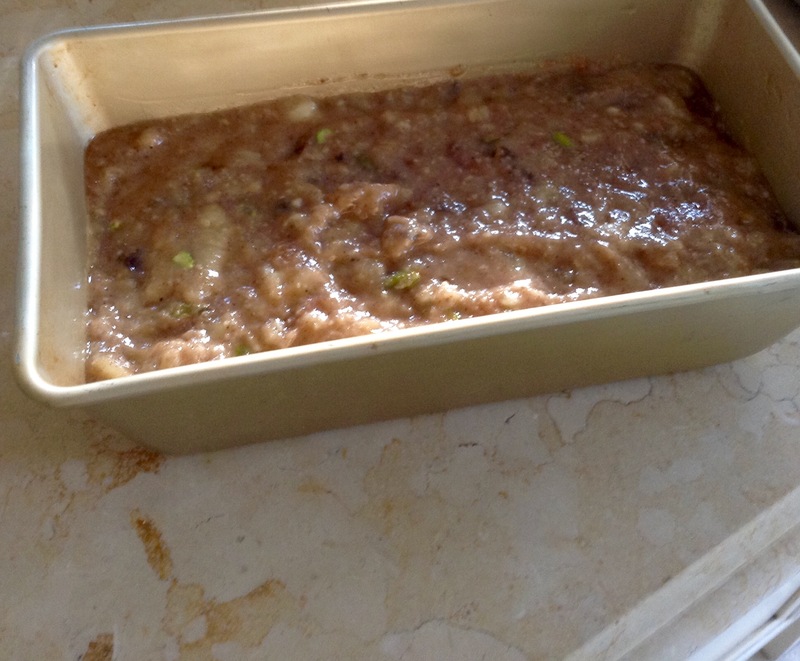 Grease a 1kg (2lb) loaf tin with a tsp grape-seed oil. I often use a disposable tin-foil loaf tin 13cm x 23cm x 7cm (5” x 9” x 3”). They’re easier for storing the cakes in the freezer, which I line with a couple of strips of greaseproof paper to make it easier to remove the cake. 3. 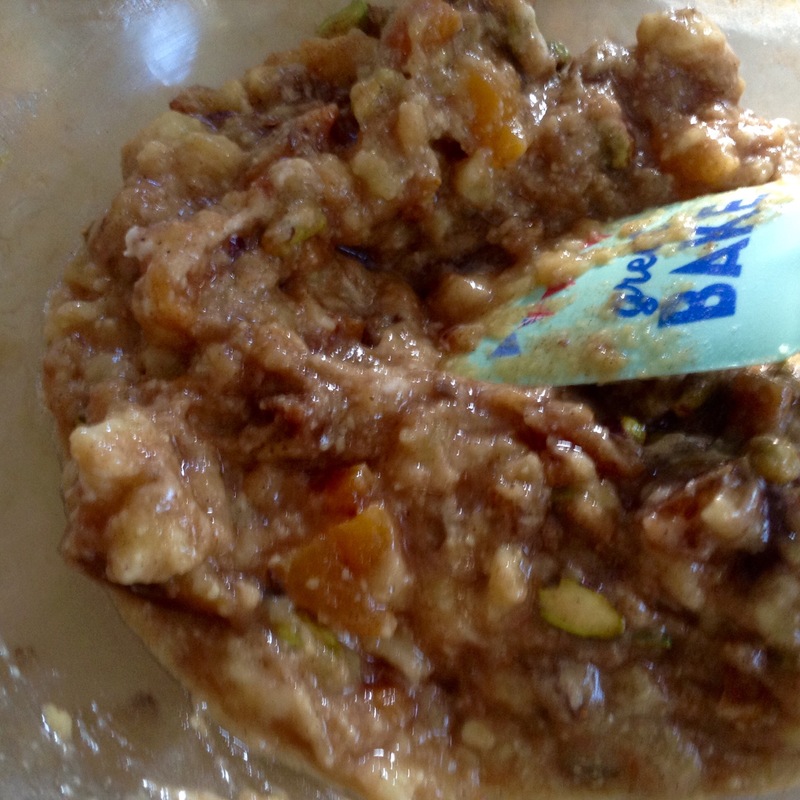 Mash bananas in large bowl – I use a potato masher – stir in the oil, maple syrup, vanilla extract. Then add the flour, baking powder, mixed spice and salt into a bowl. Fold ingredients to combine with a spatula. The mixture should have a soft dropping consistency. 4. 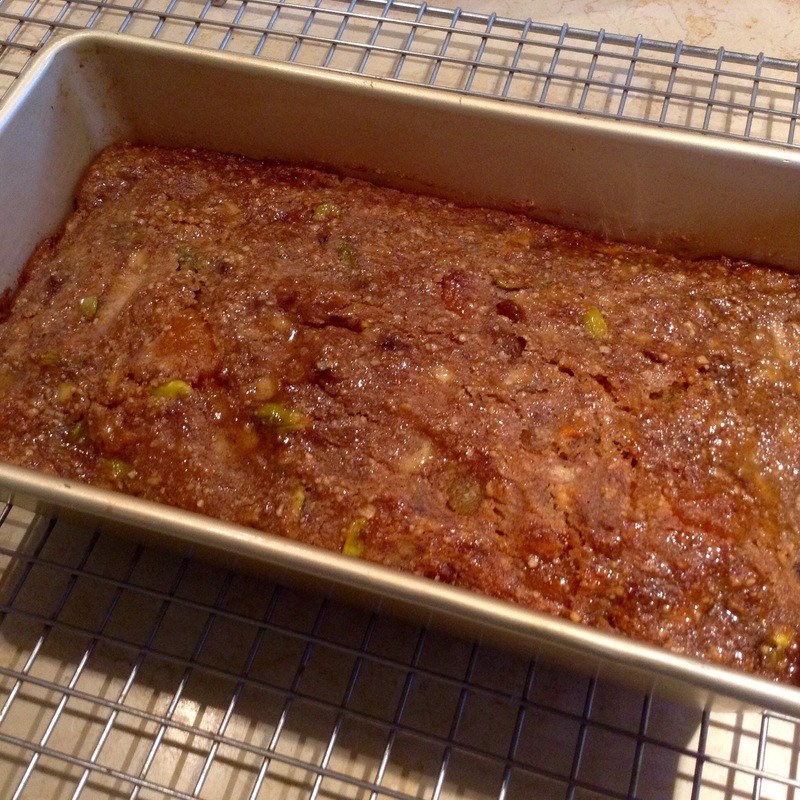 Spoon mixture into the baking pan, put it into the middle of the oven on a baking tray and cook for 45 minutes. Baking times will vary depending on the dimensions of your baking tin and your oven, so check regularly. The cake is ready when a toothpick inserted into the centre of the cake comes out clean. 7. Allow to cool for 10 minutes in the tin before turning out onto a wire rack to cool completely before slicing and eating, or freezing for no longer than two months. The bread will keep for a week in an airtight container in the fridge providing I hide it from my beloved. 8. It’s also nice sliced and toasted with almond butter according to my chief taster! 2. When I’m baking I always use a timer as it’s so easy to lose track of time. Once you’ve put the cake in the oven, put the timer on for 5-10 minutes less than the cake should take to cook and then check regularly. 4. When I have surplus ripe bananas I unpeel them, wrap them in greaseproof paper and freeze for later. If you’re making smoothies in a blender, you can add them still frozen. 5. If you don’t have any truly ripe bananas, roast them in the oven, still in their skins, to bring out their innate sweetness. 6. I used a 200g packet of mixed dried fruit but you can vary the mix according to taste. Banana bread is THE BEST! I’ve forwarded this to the boss. Thanks Sheree! Looks delicious. I was thinking of making banana bread today. My beloved has eaten all of it! proof that it was delicious.